The best AIR MILES credit card in Canada allows you to earn up to 1 mile for every $10 spent on ALL your purchases – everywhere, not just at AIR MILES partners. Because if you're a loyal AIR MILES collector, there's no need to settle for just any old credit card. Perhaps you’re looking for a premium credit card like the , which comes with a big sign up bonus, one of the best insurance packages on the market, and valuable perks like flight discounts and lounge access. Or maybe you’re looking for a card that allows you to earn rewards everywhere you shop, gives you some basic insurance, and doesn’t make you pay an annual fee…. Review all top 10 AIR MILES credit cards here. 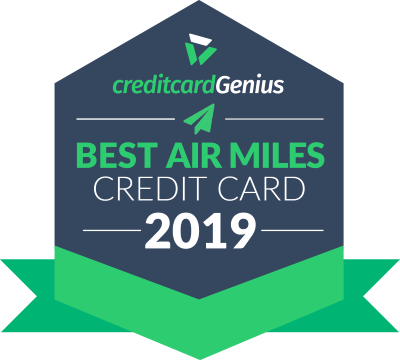 AIR MILES is a loyalty program that was founded in 1992 that gives cardholders "miles" for purchases that they make at participating locations. The miles that you earn can be used for a number of different things, from flights and hotels, to merchandise and gift cards. Plus, AIR MILES can even be redeemed like cash at participating stores. In fact, there are two main categories for earning and redeeming your AIR MILES – Cash Rewards and Dream Rewards. You can collect all Cash, all Dream, or a percentage mix of both when you earn miles but they are not interchangeable. Once you have a Cash mile it can only be used for that. Same goes for Dream miles. These options are great, but one downside is not everyone is an AIR MILES partner. They do have the most partners of any rewards program in Canada, but unless you’re willing to do some major planning around where you shop, it can still take years to build up your miles for a big-ticket reward like a free flight. Be sure to check out our full review of the AIR MILES program to learn how to best earn and redeem your miles. And, if want to earn bonus miles? AIR MILES runs frequent promotions throughout the year to boost your miles bank. You can find out more about them here. But if you want to fast track? Here are the top three best cards in detail. The is the best AIR MILES credit card in Canada, hands-down. What makes this card the best? Well, for starters, this card will give you 1 mile for every $10 you spend on absolutely anything – the highest AIR MILES earn rates on the Canadian market right now. Then, BMO gives you a 15% discount on AIR MILES flights within North America, helping you stretch your miles even further. As part of signing up, get up to 3,000 miles – 1,000 miles after your first purchase, then another 2,000 when you spend $3,000 in the first 3 months. you'll pay no annual fee for the first year. You will need either a personal income of $80,000 or a household income of $150,000 to qualify, But if you do, it's the best AIR MILES credit card you can get. don’t qualify for the big minimum income requirements that the other "premium" AIR MILES credit cards come with. In fact, it gives you a whopping 1 mile for every $10 spent on groceries, gas, travel and at AIR MILES Sponsors, one of the highest sign-up bonuses available, travel accident and car rental insurance, and a few AMEX extras like Front of the Line and friend referral bonuses. Coming in as the best AIR MILES credit card with no annual fee is the . 2x at participating AIR MILES partners. You'll get a nice sign-up bonus of 800 miles, which isn't something all no fee cards will give you. Plus, for some added peace of mind, all of your purchases made with the card will be covered with 90 days of purchase protection (that means you’re safe if your new purchase gets lost, stolen or damaged) and it will double your manufacturer warranty for up to an extra year. If that wasn’t enough, for a limited time, this card will give you an introductory balance transfer interest rate of only 1.99% for 9 months. For a no fee card, this card has a lot going for it. Whatever it is you’re looking for, there is something for everyone on this top 10 list.